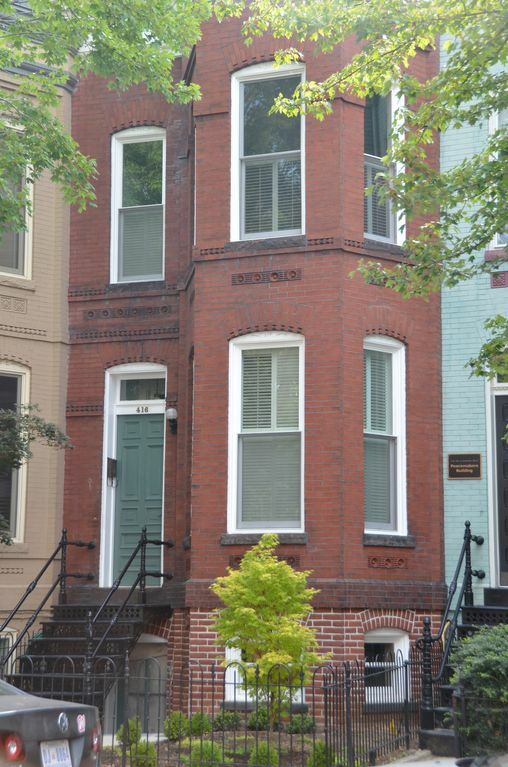 1/2 city block from Eastern Market metro, Eastern Market Suites is a masterfully renovated Victorian guest house featuring a one bedroom suite on the upper level with modern amenities located in the heart of Capitol Hill at Eastern Market in Washington, DC. You have subway access to anywhere in the city, and around the corner from Barrack's row shopping and restaurants. Eastern Market and Barrack's Row have become one of the most popular DC destination points in recent years featuring a variety of cuisines, open air shopping, and a pedestrian plaza. Your visit to Washington, DC whether for business or pleasure, will only be wonderfully enhanced by the charming, warm and welcoming environment that is Eastern Market Suites! Please check our availability below for your trip to Washington, DC and book your reservations now. You will be glad that you did! If you like this suite, but it is already reserved, please check out our other suites on HomeAway listing #368741 & #931151. History of the Guest House: Kirk Beatley is a fourth generation Washingtonian whose family has lived on Capitol Hill since the late 1800s, and where he continues to live today with his wife and two children. In 1905, Kirk's Great-Grandmother, Margaret, purchased this1890 Victorian home to entice her newly married daughter, Nell, to raise her own family in the neighborhood. Nell and her husband, John Luskey, raised their 12 children in this home. In 2008 Kirk purchased the house from relatives who had owned or lived in the house since 1905, and then Kirk and his family spent over two years meticulously restoring and renovating the home, blending old-world Victorian charm and grace with new world appliances and technology. Today, Kirk's family, a fifth generation of Washingtonians, are honored to offer you the opportunity of experiencing residential living in their newly updated family's house, in the heart of our Nation's Capitol, at the Historic Eastern Market on Capitol Hill! Bathroom is bright & charming! Apartment was clean, well-appointed and secure. The location is great, especially over a warm weekend when Eastern market is at full strength. Close to metro, and you’re on the Hill so you’re close to sites. We’d stay there again. Loved the apartment. Location is great. We were lucky to find the Eastern Market Suites for our most recent visit to Washington, D.C.; the perfect location near the subway station and dozens of restaurants and coffee shops/bakeries. The owners are very conscientious of their property, as our suite was both very nicely designed and very clean. We couldn't have found a more convenient and delightful place to spend a few days while in Washington! Location is great. It is close to the Metro and in a neighborhood that has many restaurants and bars. The apartment is clean and comfortable. Well maintained and updated appliances and furnishings. However, during our entire stay there was construction work on the neighboring/adjoining building. Most annoying was the unloading of equipment and building materials beginning early each morning. Take away the construction activities next door and this is definitely a five star accommodation. Quaint, comfortable and convenient! Having the metro steps from your door was awesome. Close to all Washington has to offer, I suggest you try the segway tour! Kirk is so responsive, he really cares about the guest experience. The apartment is comfy and convenient. Has everything you need.